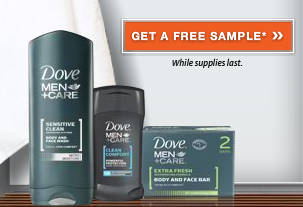 Hurry to request a free sample of Dove Men+Care Body and Face Wash & Deodorant here. My husband recently requested that I stop purchasing the deodorant that he has used for years in favor of the new Dove Men+Care Deodorant – he likes it that much. This sample is available while supplies last and will arrive in up to 4 weeks. You can also find coupons for Dove Men+Care Products in My Coupon Database.